Our Walnut Tree Hospital is located in the local centre, and was purpose built after the group outgrew our previous main site at Stoke Road (still operating as one of our branch surgeries – click here). 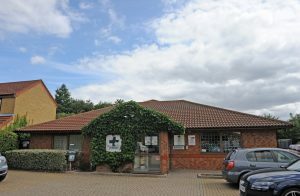 Opened in 2002, Milton Keynes Veterinary Group at Walnut Tree is the only RVCS Registered Approved Veterinary Hospital in the area. Our facilities at Walnut Tree allow us to offer a wide range of services in house, including complex surgical procedures and dentistry, as well as comprehensive laboratory testing and imaging services. Please have a look here to see more information on our facilities. Our computer systems are linked across all of our sites, so you can rest assured that all of your pet’s notes will be available should you need to visit us at the hospital rather than your local branch. The hospital is also home to our Out of Hours Service, Vets Now Ltd. Available whenever we are closed, this means you and your pet will be visiting a familiar surgery, and, should your pet ever need to stay overnight with us, they will be monitored round the clock with no need to move them between sites. More information on Vets Now can be found here. Our Walnut Tree hospital is a bustling environment, and is an ideal place to get your pet used to visiting a veterinary surgery. Our receptionists are always on hand to help with socialising your pet, armed with cuddles and treats! Appointments are available Monday to Friday with our vets and nurses at Walnut Tree, from routine consultations, advice, vaccinations, health checks and repeat prescriptions, to behavioural consultations and surgical procedures.